Bare Ranch owner Lani Estill, pictured with her daughter Anna, raises cattle and sheep on more than 40,000 acres in northern California. Photo/Paige Green. 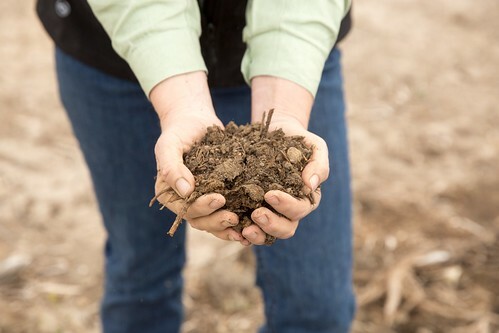 Compost helps build healthier pastures that can sequester more carbon. Photo/Paige Green. Guided by Estill’s goals and developed using the NRCS’ conservation planning process, the science-based Carbon Farm Plan incorporates data from USDA measurement tools like COMET-Planner and COMET-Farm. These whole farm and ranch tools serve as a greenhouse gas and carbon sequestration accounting system for the operation. The Bare Ranch Carbon Farm Plan prioritizes practices that sequester carbon, add perennial biomass, and grow healthy forage. It assesses the ranch’s ecology and soils, and then recommends management practices to improve soil health and sequester more carbon in the soil and perennial biomass. While conservation practices that build the land’s carbon reserves can help mitigate climate change, they also help increase resilience to changing climate conditions, enhance overall productivity, and improve the water-holding capacity of the ranch’s soil. As the public becomes increasingly aware of the environmental impacts of their food and other consumer products, many ag producers and manufacturers are turning natural resource conservation practices into a competitive business advantage. 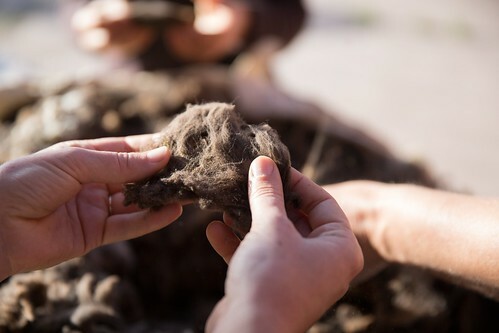 The Bare Ranch Carbon Farm Plan has helped the owners produce a “climate beneficial” wool beanie in partnership with The North Face clothing retailer. The hat, and its conservation story, tap into a growing consumer demand for products that benefit the environment. By measuring the impact of their conservation practices, Bare Ranch has provided the transparency and quantified conservation value of their wool production that companies like The North Face—and consumers—are seeking. The Bare Ranch Carbon Farm Plan has helped the owners produce a “climate beneficial” wool beanie in partnership with a national clothing retailer. Photo/Paige Green. Thanks to NRCS quantification tools and the science-based Carbon Farm Plan, Bare Ranch can determine how much carbon it sequesters annually. And when consumers purchase wool products made from Bare Ranch fibers, they are directly supporting the conservation mission shared by Estill and NRCS. You can learn more about the Bare Ranch story by listening to this Capital Public Radio story. A "tip of the hat" to all of those at Bare Ranch, NRCS, and everyone on the conservation team that partnered to provide such an inspiring example for the rest of the world! You may want to check out Mountain Meadow Wool, 22 Plains Drive in Buffalo WY. They are a wool yarn manufacturer. They work with local sheep ranchers to take in the raw wool and then turn it into wool yarn which is sold locally, nationally and internationally. The ranchers have a direct say in how their product is marketed. It is great to see that there are so many benefits from implementing conservation practices. I see a lot of rain gun action in the background of the photo, but no mention of irrigation in the text! Rain guns are not all that sustainable. Water losses through evaporation; energy to drive pumps; depletion of underground or river reserves of water... there are quite a few no-noes. Irrigation through dribble bars, perforated pipes and others is preferable. But getting the pasture to find it's own moisture with thicker and higher sward cover; not allowing sunlight to strike the soil surface; growing deep rooting plants that thrive in try conditions. These and other actions should reduce the need for irrigation. Especially when there is 40,000 acres to play with! I farm 150! We have sheep and goats for many years. How can manure be re used? You can kiss the bighorn sheep that share these grazing allotments goodbye. Pasturella hymolitica from the domestic sheep WILL result in a 90%-plus die-off in those wild herds...as the USDA knows full well.